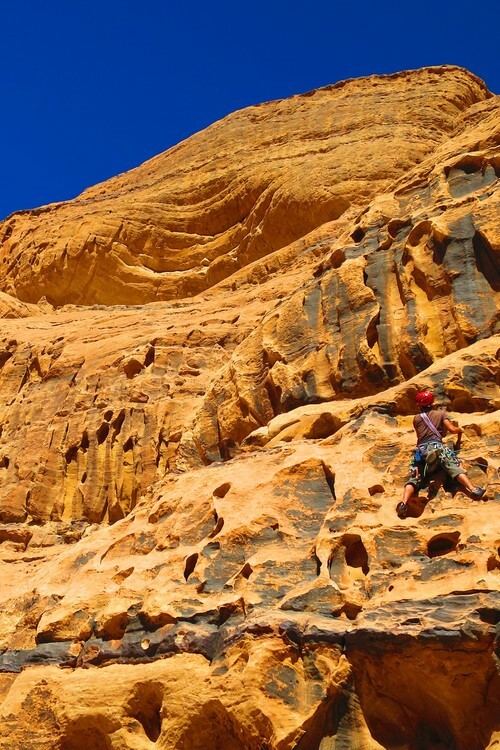 Climbing on jordanian Waddi Rum sandstone is one of the most beautiful experiences that a climber or mountaineer can live. Waddi Rum is the name of the village and of the range located at the southern end of the country, at the endof the road, depositing us truly at the entrance of the desert, where suddenly rise these 600m rounded peaks that one can climb . The choice is huge: Bedouin routes, to be absolutely done, opened by local hunters, of easy level (grade 3-4) but with a bold progression, or more recent routes from 100 to 600m, mostly grade 4 to 6. In any cases the adventure is total. The nonexistent spits, it is the realm of trad climbing and route finding for itineraries which take us to unsuspected and unimaginable places. Thus lost in the desert, in an atmosphere sometimes unreal, we will make surprising and original climbs to your level. A new and amazing experience guaranted! Day 3: "The Pillar of Wisdom", 600m of climb to reach the top of the Jebel Rum cliffs, descent by Hammad's Dome, a Bedouin route. 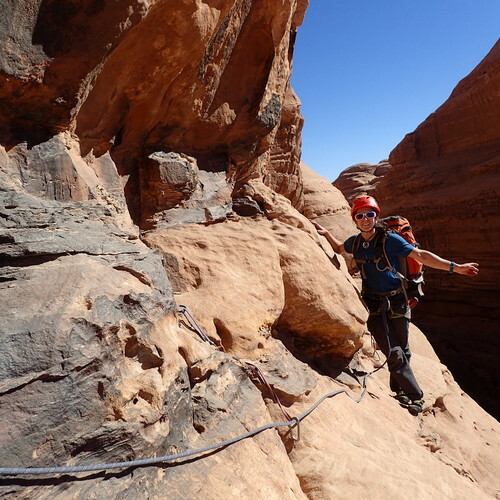 Being comfortable in the 5c / 6a second allows to explore a large part of the routes, but a grade 4-5 climber can also have a lot to do, especially Bedouin routes. The approaches are usually limited by the use of 4WD (5 to 30mns) but the days can take 4 to 8 hours of effort with descents often by walking. 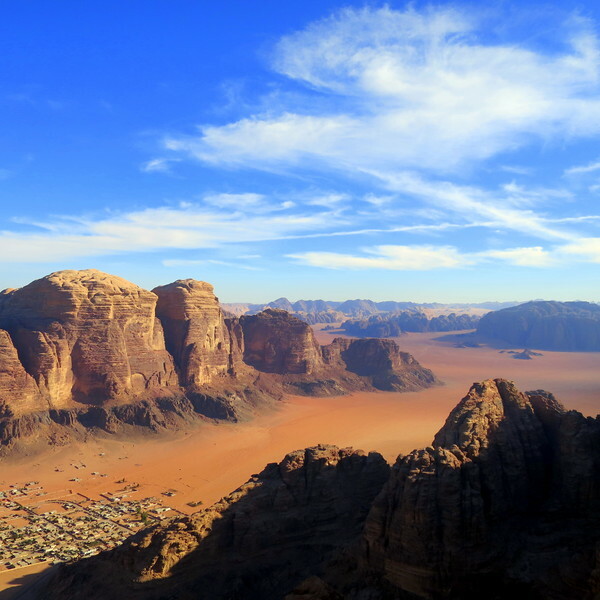 Bedouin routes that can also be like long hikes with exposed sections and easy climbs, so having good physical condition is necessary. We will be welcomed by Atayek, a Bedouin from the village of Waddi Rum for whom hospitality is an important value. We will stay at his home but also in his camp in the desert, where to spend an evening and a night after a meal cooked in the sand is an unforgettable experience ... Atayek, who speaks English, will also be our 4WD driver to take us in all the recesses of the desert he knows as his pocket!